Some scholars consider Om to have been variously held as the "cosmic sound" or "mystical syllable" in ancient India, or simply as "affirmation to something divine". 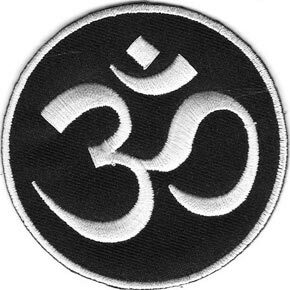 This om symbol patch measures approximately 3" in diameter and comes in assorted color schemes that may differ from the picture. One will be chosen for you based on availability. Have a color preference? Put it in the comments section. No promises, but we will try our best!